PropertyBoss is a powerful property management software for property managers of medium to large sized businesses. It is an intuitive solution that offers world-class support, flexible functionality, and customizable features to streamline the management of single family, student housing, and multifamily. The platform adopts a modular, lease-based approach to property management to allow users to monitor tenants from lead through a lease. PropertyBoss is available as an on-premises (with multiple networked users) or cloud-based solution and is compatible with Windows and Mac-based devices. It’s also a QuickBooks (Intuit) Gold Developer that integrates seamlessly with other popular financial packages. The platform is all-inclusive, but users can select their ideal industry-specific components and customize the solution to suit their unique business needs. 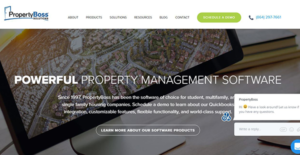 PropertyBoss is a comprehensive property management platform that comes in three core modules including student housing management, multifamily management, and single family management. The modules provide a full spectrum of features that automate and streamline functions for property managers. They work in tandem with the auxiliary functions of communication tools that integrate seamlessly with the application. The student housing management module provides customizable parents and student portals. The portals simplify the creation of work orders, renewal of leases, payments, and the management of accounts. It gives you the ability to manage your student housing by bed or suite and eliminate the chaos experienced during mass move-ins and move-outs. The self-inspection feature lets the student conduct inspections and submit their results via the mobile app. In addition, PropertyBoss comes with a powerful yet very easy to use single-family management module. The module provides reliable features such as the tenant screening tool designed to streamline the processing of new rental applications. The tool allows you to run criminal, credit, eviction, and background screen on all new applicants with just a single click. Another noteworthy feature of this module is the accounting systems integration. The module integrates with accounting applications such as QuickBooks to help you measure your expenses and track income accurately. Better still, there is a multifamily management module that offers robust features such as rent collection, online application, resident screening, lead to lease, and detailed reports. The online application is one of its popular features designed to allow prospects to tender applications via computer, smartphone, and tablets. Also, PropertyBoss has a feature that simplifies the lead to lease process and enables you to deliver a better experience to your residents. If you are interested in PropertyBoss it may also be beneficial to check out other subcategories of Best Property Management Software collected in our database of B2B software reviews. There are well-liked and widely used solutions in each software group. But are they essentially the best fit for your organization’s unique requirements? A market-leading software product may have thousands of customers, but does it provide what you need? For this reason, do not blindly spend on popular systems. Read at least a few PropertyBoss reviews and mull over the factors that you desire in the software such as the price, main tools, available integrations etc. Then, choose a few systems that fit your wants. Try out the free trials of these platforms, read online reviews, get explanations from the maker, and do your investigation meticulously. This in-depth homework is sure to assist you choose the most excellent software application for your firm’s special needs. How Much Does PropertyBoss Cost? PropertyBoss doesn’t avail its enterprise pricing information to the public. Contact the vendor to get a detailed pricing structure. We realize that when you make a decision to buy Property Management Software it’s important not only to see how experts evaluate it in their reviews, but also to find out if the real people and companies that buy it are actually satisfied with the product. That’s why we’ve created our behavior-based Customer Satisfaction Algorithm™ that gathers customer reviews, comments and PropertyBoss reviews across a wide range of social media sites. The data is then presented in an easy to digest form showing how many people had positive and negative experience with PropertyBoss. With that information at hand you should be equipped to make an informed buying decision that you won’t regret. What are PropertyBoss pricing details? What integrations are available for PropertyBoss? If you need more information about PropertyBoss or you simply have a question let us know what you need and we’ll forward your request directly to the vendor.